An Ends of the Earth epilogue! 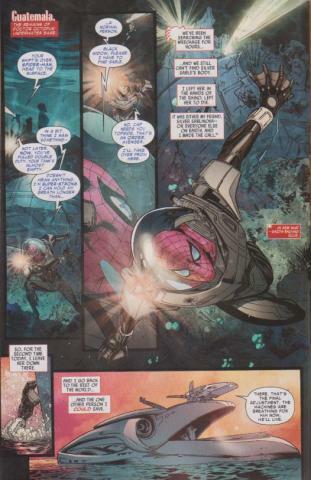 After the tragic events from the Amazing Spider-Man #687, Spider-Man & the Avengers search the wreckage of Doctor Octopus’ underwater base for the body of Silver Sable. On the way to transport Doc Ock to the maximum security prison for super villains known as The Raft, Spider-Man tells a happier tale of one his adventures with the beautiful mercenary from Symkaria. 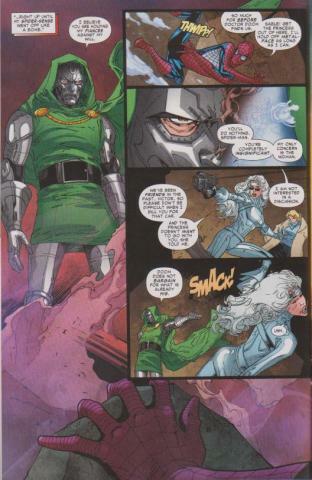 Featuring more doctors than the province of Ontario such as Doctor Octopus, Doctor Strange & Doctor Doom. Part EOTE epilogue. Part flashback. 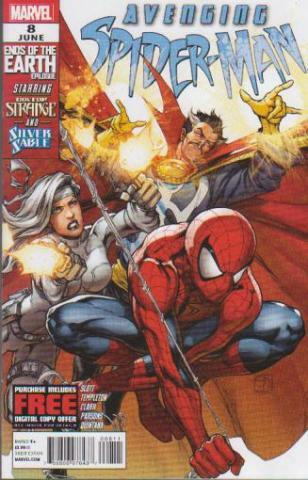 Spider-Man feels some guilty as he tries to deal with the loss of Silver Sable. The flashback story has some generic, but familiar Spidey action, along with a few chuckles involving a marriage proposal & a possible wedding night. Written by Ty Templeton (Spider-Man & The Human Torch) & Dan Slott (The Amazing Spider-Man). Matt Clark’s clunky illustrations are what will force my hand into giving this comic a low rating. Wanting closure to the Ends of the Earth saga is the only reason I picked this up, but I wished they had put a little more effort into it. From Marvel Comics. Sounds like a good one to skip. Too bad Ends of the Earth started out so good but ended with a whimper.